President Barack Obama's wisecrack about a "Slurpee Summit" has the makers of the sugary drink scrambling to take advantage of the free publicity. Throughout the election campaign, Obama joked about Republicans standing by with their Slurpees while Democrats did all the work for the country. In a post-election press conference Wednesday, Obama joked about Republicans and Democrats meeting for a "Slurpee Summit." "They're delicious drinks," he said. "This is a rare opportunity for a brand," said Margaret Chabris, a spokeswoman for 7-Eleven, which makes the 44-year-old Slurpee told USA Today. "We don't want to be opportunistic, but nothing has ever been this big for Slurpee." 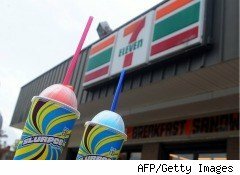 7-Eleven is launching an advertising campaign to focus on the idea that Slurpees bringing people together, USA Today reported. The company's is considering a complete rebranding around the idea. The company has even told the White House that it will cater a Slurpee summit, offering red Slurpees for Republicans and blue for Democrats. "We'll even offer a purple Slurpee, since that's what you get when you bring red and blue together," Chabris said. This is the latest example of companies trying to cash in on an Obama "endorsement." Clothing companies such as J-Crew (JCG) saw a spike in sales and stock after First Lady Michelle Obama wore their products. In 2008, Barack Obama gushed about Fran's Chocolates. The chocolatier then saw a jump in demand.